How did Il Cinema Ritrovato inspire you to start your own festival? 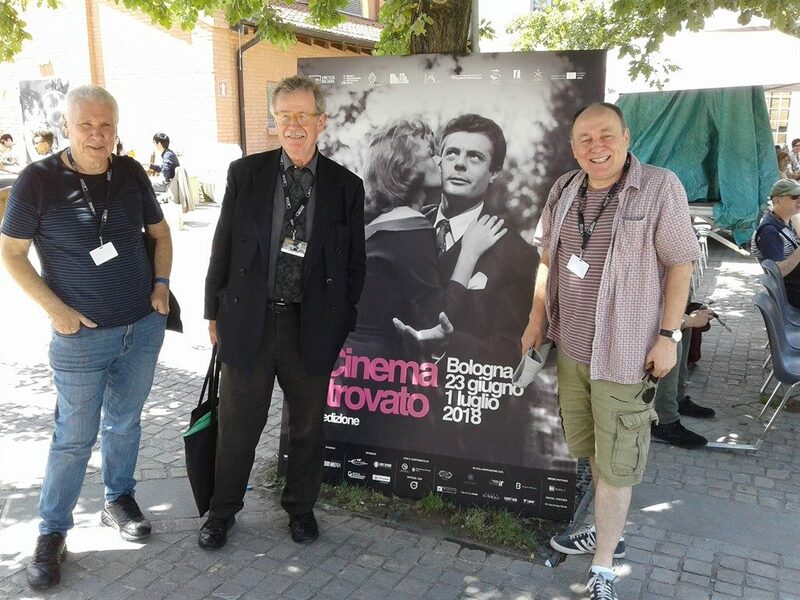 Mark Cosgrove, founder of Cinema Rediscovered: I had been coming to Il Cinema Ritrovato in Bologna for several years and was struck by the audiences watching the history of film on the big screen and really responding to it. One of the defining moments for me was at a screening of John Ford’s My Darling Clementine. Peter von Bagh told the packed auditorium: “This is the greatest American film ever made” and I thought to myself, “you must be joking, it’s not even the greatest John Ford film.” But by the end of the screening I actually thought he might just be right! That focus that only a cinema can provide really made me engage with the film. So when we came back to Bristol one year we got together with a group of very active cinephiles there and suggested putting something similar on, and of course everybody was really enthusiastic. Geoff Gardner, founder of Cinema Reborn: Cinema Reborn partly came about from the fact that Sydney doesn’t have the equivalent of what there is in virtually all the other capital cities, which is a cinematheque: a state-supported place which screens films, lends them, has exhibitions, etc. Coming back last year from Bologna I kept thinking “you have just got to do this, you have got to find somewhere that will put something on.” I tried contacting a number of places, then finally got in touch with the Australian Film, Television and Radio School, which has state of the art facilities including a theatre which doesn’t get used much as the school doesn’t programme films. The director of the school Neil Peplow really liked the proposal. How did you approach Il Cinema Ritrovato to let them know you were planning similar events? MC: We had gotten to know Gian Luca Farinelli and Guy Borlée during the workshops that were held for Europa Cinema exhibitors, which includes the Watershed. We asked for their blessing that we could do this and Gian Luca very generously said it would be good to have a British relative. He came over to the first edition of Cinema Rediscovered and presented films, as we take some of the Cinema Ritrovato programme and restorations done by Cineteca di Bologna. GG: Il Cinema Ritrovato jumped on board, Guy Borlée said it was a wonderful idea. Three things were particularly important to us: the selection of films, good introductions and a really good programme book. Il Cinema Ritrovato provided a model for all of that - Bologna’s programme book is a fabulous piece of work. We also knew that the Cineteca di Bologna had films that we were also interested in showing. This year we took five of their films. By doing so we also ended up facilitating contact between the Cineteca di Bologna and the Adelaide Cinémathèque, who also then showed their films. Was coming here and meeting other people in the archival film business another influence in wanting to stimulate that network in Bristol and Sydney? MC: Coming to Il Cinema Ritrovato you realise that there is global community of professionals as well as the public. Everyone who is in that world of restoration and digital comes to Bologna. Like any great festival it should be a meeting place for professionals as well as a great celebration. Audiences too are fascinated when how you explain to them how film is archived and restored. So the connections with the professional world here in Bologna has been priceless. I just met the person who programmes of the equivalent in San Francisco - you can begin to share ideas and programmes because film is truly a global phenomenon. GG: One of my treasured memories from last year’s Cinema Ritrovato is a photo of Gian Luca conducting a meeting over dinner and you can see all the programmers who were there: there is a two-and-fro about the selection. I think that festivals can get very autocratic about how they select their films. We tried to involve people from outside our committee. As for the reception of the first edition of Cinema Reborn, we had a great response from some significant critical and filmmaking figures, who all came in to say how much they enjoyed the festival and how we had to keep going. Have you witnessed a lot of enthusiasm amongst young people coming to your festivals? MC: What you realise with internet and with social media is that young people are actually writing about film and are accessing film in interesting ways. Tapping into those communities of interest that are online and bringing them together into a place where film is being presented in its original form is something that we are trying to do with the future film critics workshop at Cinema Rediscovered. GG: The Australian Film, Television and Radio School requested that its students should attend Cinema Reborn for free. A couple of students came to everything, but it’s fair to say we didn’t get an overwhelming response from them. Next year I am going to propose that we have a rushline for university students too, so they can attend screenings for free too. Several young people were also enthusiastically involved in the communication and ticketing of events. Mark Cosgrove is the Cinema Curator of Watershed in Bristol. He also programmes for Encounters International Film Festival after many years as its Director. In 2016 he founded Cinema Rediscovered. The third edition of the festival will take place 26 - 29 July 2018, in Bristol, UK. Geoff Gardner is an Australian film writer who has also worked in film distribution. He is the former Director of Melbourne Film Festival and now Chairman of the Cinema Reborn organising committee. The first edition of Cinema Reborn took place 3 - 7 May 2018 in Sydney, Australia.